According to American Demographics, nearly 90 percent of U.S. women wear makeup at least some of the time. However, many know little about the dizzying array of products available, the history of makeup, how it's made, its physiological effects and its societal significance. The products are such an intrinsic part of our society that they lend themselves to a wide range of science fair projects and many of those are achievable for 8th graders. 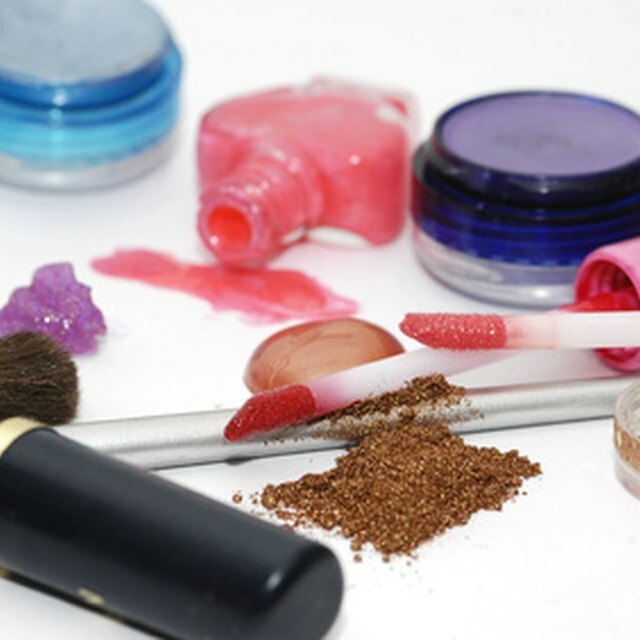 Like many household items, makeup attracts and grows bacteria. An interesting project would be to test brand-new makeup for bacteria content, and then test makeup of the same brand used by you and your friends and track the differences. Another idea would be to introduce bacteria to samples of five different brands of the same type of makeup and measure growth over time to discover which are the most likely to support bacteria growth. Finally, you could test makeup past its use-by date to find out if it promotes bacteria growth more than fresh makeup of the same brand. Become a cosmetic chemist by developing your own cosmetics for a project. Lip balm, lipstick and mascara were all made at home at one point. You can make your own makeup items and compare them to commercial products by determining if they last as long, adhere correctly and do their jobs as well. Then you could have your friends wear your product and report on the results, which you can compile into informative charts and graphs. Alternatively, you can test several versions of the same product using variables like different dyes, flavors and ratios to see if you are able to improve on commercial products. You can report on your successes and failures and attempt to explain the factors that led up to the outcome. Some studies say that about a third of British women won't even leave the house without wearing makeup, leading to speculation that cosmetics are often linked to self-esteem. You can explore whether makeup improves the self-esteem of women and girls by asking your friends who use makeup — and their moms — to go without it for a week. They can keep a daily diary about anything that happens related to the absence of makeup. Similarly, you could have friends who wear little or no makeup use it regularly for a week and keep a diary. The use of makeup ranges back to at least 10000 B.C. For an informative science project, you can research the history of makeup and its significance in the societies of the past. You can prepare short reports about what societies used makeup to indicate status, beauty, wealth and healthiness. Another approach would be to report on ritual makeup in ceremonies and the everyday life of women (and sometimes men) in societies throughout history, and how these roles apply today in various societies, from advanced industrial nations to relatively primitive tribes in remote areas. PeterHisey. "Eighth Grade Science Fair Projects Involving Makeup." Sciencing, https://sciencing.com/eighth-grade-science-fair-projects-involving-makeup-12165436.html. 25 April 2017.